Yesterday I was forwarded one of the most petulant, childish, and just plain mean e-mails written by a member of the Frederick County Council. At first, I wasn’t sure if some teenage troll had hijacked their e-mail account, since we all know how well Frederick County handles IT security. However the e-mail appears legitimate. This is definitely not the first time that a Councilmember has flown off the rails, much to the embarrassment of our County. Spoiler alert……you ARE allowed to speak with OUR staff….and our legal counsel is OUR staff. Archer does premier on April 5th, apparently they are really eager for Season 8. “Spoiler alert” is a commonly used phrase by the womanizing and idiotic main character. One could make an argument that some personality aspects of the Archer character really do fit the Councilmember. 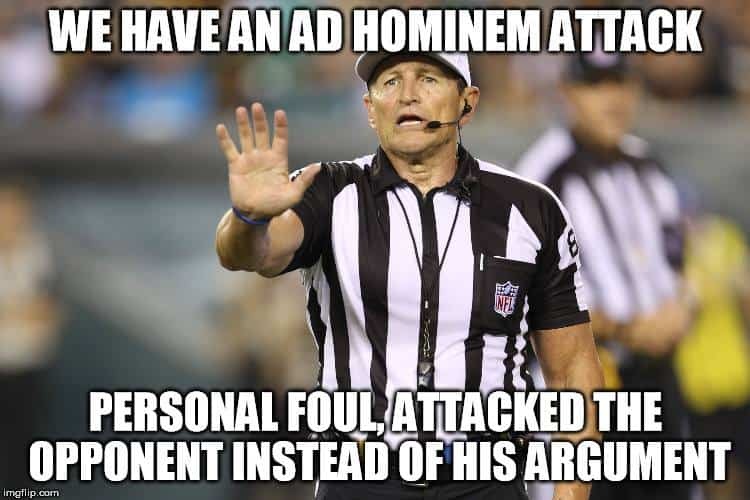 You know that an internet argument is getting serious when WORDS GET CAPITALIZED for emphasis. Or they are trying to yell at THEIR COMPUTER SCREENS. Plus we get the nice bonus feature of a second Archer reference. I get it, I am REALLY excited for Season 8. But please, quoting Archer must be violating the County Council Civility Code. Your comment regarding “the agenda” – what exactly are you talking about? There is NO agenda. I based my arguments solely on the findings that I presented on Tuesday during my motion. Even more emphasis and denial of a planned agenda. You aren’t fooling anyone, what politician DOESN’T have an agenda? SPOILER ALERT……every politician has an agenda. The existence of an agenda is not good or bad. It is an action that we elect someone to do. If you do not have an agenda for Frederick County, then why are you legislating? Does this mean you have no legislative remedies for our County to fix the numerous complaints that the citizenry and local business has about how our County government conducts business? Please assure me (and all these people you decided to cc on this email) that you were not so unfamiliar with the job of a legislator that you inadvertently ran for the wrong office? I must admit after two and a half years, I really cannot tell. Some pretty harsh words. I would call this excerpt a blatant personal attack. This has nothing to do with the business of the County, nor does it have any bearing or impact on the issues. It was merely a way for the writer to lash out in anger. So much for that “civility code.” My favorite referee has something to say about this. Finally, please do me the courtesy of spelling my name correctly. It really is not that hard. Nothing is more petulant than complaining about spelling and grammar (except Brandon, he’s cool). There are so many issues of concern I have with this three sentence email, I hardly know where to begin. 1) Why after being in elected office for the past almost 6 and one half years does it seem that you do not understand who you can and cannot speak to during a zoning application process, specifically after the record has been closed? Spoiler alert……you ARE allowed to speak with OUR staff….and our legal counsel is OUR staff. Therefore, I (or any other Council member) am allowed to speak with our counsel before, during and after the record is closed. I am troubled that you apparently do not know this. 2) Your statement regarding my supposed “fictitious legal argument”: Again, you have been in elected office for more than 6 years….why does it seem that you do not understand if something is contained IN the record, it is considered part of the record and can be used in any argument FOR OR AGAINST the application. Spoiler alert #2……The citations from the county code that I used to support my findings are actually contained in the information we received from the applicant to support their application. Did you not read all the information we were provided regarding this application? And if not, perhaps you should have recused yourself from voting on it. 3) Consistency of RALE or any other organization has nothing whatsoever to do with our deliberations on this or any other application. I’m not even sure where that came from. 4) I will not even address the statement regarding the FACT letter since that matter is still in court and the subject of litigation. Also, we have been advised numerous times by our legal counsel to not speak about this issue while it remains in litigation. 5) Your comment regarding “the agenda” – what exactly are you talking about? There is NO agenda. I based my arguments solely on the findings that I presented on Tuesday during my motion. I will insist that each application has to stand or fall on its own merits. Also, I am curious, why does it seem that you see “monsters” behind every bush? 6) Finally, I have listened to you gripe and complain about those of us here on this Council from day one, yet I have seen not one piece of legislation from you. You were elected to LEGISLATE Councilman Delauter not run the county – that is the job of the Executive. Please assure me (and all these people you decided to cc on this email) that you were not so unfamiliar with the job of a legislator that you inadvertently ran for the wrong office? I must admit after two and a half years, I really cannot tell. 9) Finally, please do me the courtesy of spelling my name correctly. It really is not that hard. All of the above quotes are from Councilwoman MC Keegan-Ayer (text in blue was Councilman Delauter’s responses). 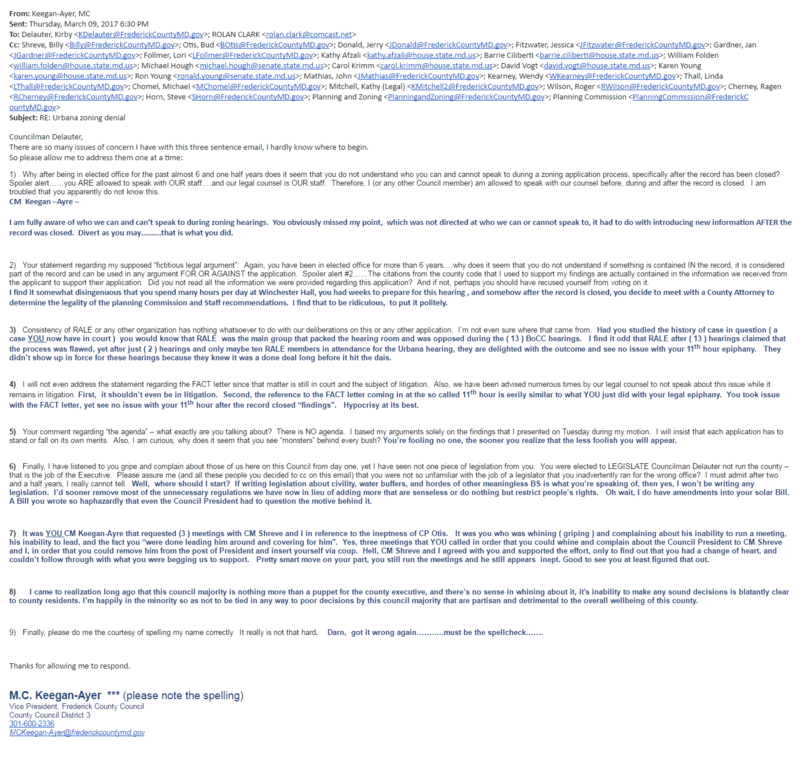 In some e-mail interactions, CM Keegan-Ayer decided to have a full blown meltdown with CM Delauter over the Urbana rezoning application. Be honest, you thought it was Delauter or Shreve. That’s the point. For the last 2.5 years, Frederick County media and faux-media have been lying and selectively editing the comments and viewpoints of conservatives, libertarians, and really just anyone with common sense to fabricate these evil personalities that we all hear about. Just ask James Grose about deceptive editing and falsified comments taken out of context. Don’t be fooled. Councilwoman MC Keegan-Ayer is just as hot-headed and mean as any other person on Council. The Democrats in our county make the same vile, nasty, and repugnant remarks that Republicans make. The only difference between Democrats and Republicans in this County is that the Democrats have been good at hiding their paper trail, for example when they threaten a media outlet with a lawsuit for reporting on the 5th Amendment violations along Ijamsville Road. Personally, I would rather have contentious and honest behavior at County Council meetings. Sure beats collaborating and deciding the vote before the legislation is even introduced. Plus, it’s not illegal.